old school structure will be miles away. Happy behavior change days of yore. job displacement will be miles away. Happy quantifiable days of yore. Gather a paper trail once more. Klout a shining star upon a follower now. And have yourself a Social HR Holiday. Wow! Many of you know my back story. I fell into social media back in 2009. Like most HR vendors I searched out the market I sell to. But, what transpired in that search did not exactly lead directly to my customer. Late night tweets, revolutionary think-tank mentality and conference meet-ups changed how I understand and interact with my customer and how I understand social media as a tool for business. Social media is here to stay and businesses are begging for help to manage an ever-growing segment of business communication. People ask me how we do it all the time. A Harvard Business Review post talked about social media trends for 2012 and named HR in the trend set. Specifically “gamafication” was mentioned when developing systems for employee motivation and the “cult of influence” which is a well documented success at Zappos, influencing employee performance, retention and brand cheer leading. I have personally witnessed HR and marketing careers totally transformed by social media. The HR think-tank twitter mentally of 2009 has morphed into 2011 defining and applying usefulness for social media in recruiting, personal branding, incentive strategies, work-place policy, labor relations, employee behavior, employee performance and corporate community management. Social media is a communication tool. A tool that must be learned. A process that must be implemented and managed. Networks grow. They don’t just appear. And they must be sustained or they will fade away. 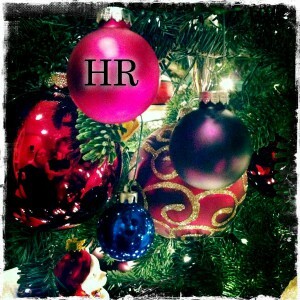 HR is Changing. Be the Trend Setter. Social Media-minded HR professionals now is the time to seize the moment. 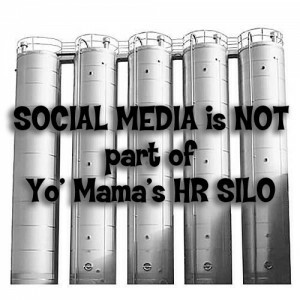 Don’t get caught in an “HR Spring” of social media risk mitigation. You are on the cutting edge to create best practices in your organization with regards to social media across business segments. But, it is up to you to help define those best practices. Here is great stats post by “Blogging 4 Jobs” on how HR is using social media. How is social media migrating into your business or organization? Do you know? And are you ready to go outside of HR to find out? Help your employees become empowered by social media to push the best of your business. Give them the rules, the expectations, tell them about reputation pitfalls and guide them to wise use personally and professionally. Shape every employee as walking customer service reps and brand ambassadors. I feel the Coca Cola Company has it going on. http://www.thecoca-colacompany.com/socialmedia/ I’m sure there are other great company policies out there as well. Educate yourself now. Small businesses are clamoring for consulting advice. I feel every law firm and HR policy firm needs a passionate social media consultant to advise them before social media policy is written. A good policy needs to be guided by the tool’s usefulness not just the tool’s risk. There is no one-size-fits-all social media plan. It must be evaluated based on the individual business market and community culture. Okay, So you Wanna Get Paid?! I have had the pleasure of meeting some pretty smart business people online through social media. Typically I find them engaged, driven people, fueled by personal interaction and the online methods that connect them to niche markets and professional fields of practice. These are the golden natural abilities that make them skilled social media users. I also believe this economy has pushed people online to network and find their customer or find a job. And as networks grow, so does the complexity of managing that network and understanding how to leverage it to help your career skills or the business you work for. As of late, a trend has emerged with several in my online HR network. They are figuring out how to take all of this social media experience to the next level and make it part of their job. Here is the question I get. How can I get someone to pay me for social media consulting? My answer: tell your network and hang out the shingle. Tell people what you do. Describe your social media management services. Own it. Tell them the results you expect to give them. But, you have to decide your niche. Do you cross over into marketing? Law? Recruiting? Customer service? Training? I’m not talking about helping a company set up a twitter or Facebook account. Any monkey can do that. I’m talking about helping a company understand how to use the tools effectively to engage, educate, broadcast, listen, collaborate, participate and build community relationships. And please help them understand why these things matter even if they do not lead directly to sales. I can tell you they do lead indirectly. Online reputation matters. Much in the same way brand awareness works to help your customer remember you or refer you when they, or someone they know, are in need of your products or services. Here is another reason why social is important and why you should be getting paid to help businesses. It may not be as important to the C-suite but, it is important to customers, specifically those under 40. Why? If you do not have a social footprint you are distrusted and seen as behind, out of step with the marketplace. Does business want their brand unreachable and un-engageable in the world of smart phones and Facebook? So write your business plan and publish basic pricing packages for your services. Do I know what to charge? No idea. But, charging anything is more than some of you are making now in social media. So put prices out there to see what the market will bear. Looking for a promotion at work? Pitch your social media contribution. What are you waiting on? Spell out the value your knowledge brings to the table and show how to apply it. Then send an invoice. In the end, I also feel those in HR need to understand the application of social media skills are a hybrid, some way out of the HR box. My business is a great hybrid example that has helped us survive this economy. We are not a trophy shop or a custom frame shop. We are a hybrid of custom framing, trophy shop, design firm, brand promotion and manufacturer of our products. If I was just a trophy shop we’d probably be long gone by now. And I am committed to my business. I am not a social media consultant. I just love to use it and blog about it. I need a referral list. I’d love to publish a list of HR professionals across the country ready to consult on social media. You know who you are. Some are out there doing it well. And I think there is room for more. Especially relative to industry expertise. Send me your info! Do you have info to send? I know you have the talent. I will tell people with a guest post on your blog! New social technology application is not a nice neat package for your HR silo. You must see yourself as a trainer, a marketer, a policy enforcer, a user of technology to engage and communicate. Set your price, sell your services. Buyers are waiting. Your boss is hungry for new ideas. But, you have to be clear about a plan and spell out the results. Social relationships matter. It is the human in human resources. It is why HR needs to be a strategic player in social media. Step out of the silo and sell it. Seriously, I would love to compile a list of professionals ready to market their HR social media consulting services to small and mid-size business. You know who you are. Contact me. Cyber Monday has come and gone. But this bacon fan’s holiday shopping list is still long. I’m always looking for unique gifts for my friends and family. And bacon products are always fun to shop for. I have run across some pretty cool stuff in my online shopping search and thought I would share some of my favorites with you. Bacon Pennant Available on Prank Place. Bacon Freak is one of my favorite sites. 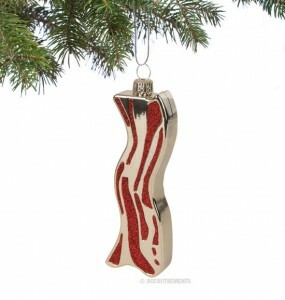 And I could not pass up a bacon ornament. It was definitely a “one for you and one for me” kind of gift item. Available here. Yes, that is me posing silly at a Nashville Tech conference photo shoot. No cigars were smoked in the making of this image. But, I was asked constantly where I bought the shirt. 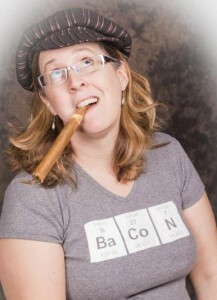 You can have one too at the Royal Bacon Society Website. 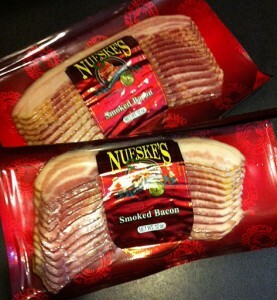 My HR blogger pal Joan Ginsberg turned me on to Nueskes Bacon this year. The smoked bacon is supreme. It will fry up to a serious crisp and has a smoke flavor that would add depth to any recipe. Nueskes has a great selection of gift packs. It would be a more demure gift for the boss than the one pictured above. 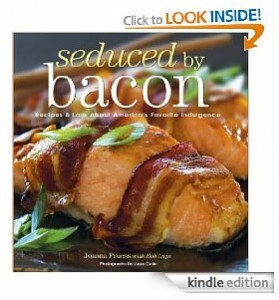 There are several bacon recipe books on the market. One that I have recently downloaded to my Kindle Reader is a foodie, gourmet cooking delight. There is no quick 30 min meal. You must be ready to cook with the love, detail and patience only allowed me on vacation and for special dinner parties. “Seduced By Bacon” moves recipes from breakfast fare to dinner, vegetables and dessert. I always knew bacon could be for dessert. Some people say it is a vegetable Download it now! It is the season for giving. Sense of humor allowed. 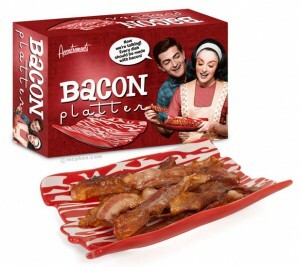 Find this and many other bacon items on Archie McPhee. Why? 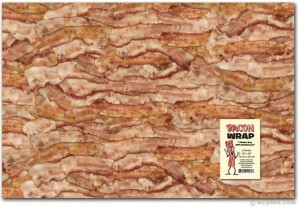 Because everything is better wrapped in bacon. This one has been tweeted and shared a lot. Thanks Robin Schooling and a host of others who brought this jewel to my attention. Think Geek.com had them! Popular! They are out of stock, so you might try Bacon Freak. 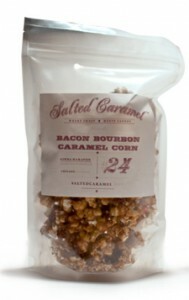 If the taste memory of the popcorn at HRevolution in Chicago is a craving not to be denied, order some here. While we are plugging bacon we might as well plug beer. Craft beer is a great gift alternative to the perfunctory hostess gift bottle of wine. Seek advice from your local package store about the latest local bacon inspired brew in your area. They are popping up everywhere. Shout out to my Western NC Peeps with a recommendation for Pisgah Bacon Stout. 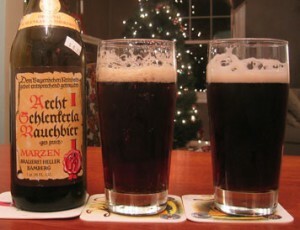 http://pisgahbrewing.com/ It is a seasonal beer with a hint of nutty and smoky. If you can find it, it is gift worth remembering. Or check out this article on the 10 best beers for breakfast. It is actually called BAKON Vodka. Why not since we are onto alcohol gifts. I have had a version of this Bloody Mary in Austin, TX made with this bacon -infused Vodka. Genius. Well worth the effort to track down a bottle. Lets not leave out household accessories. This little ditty might not go with the heirloom silver and Grandma’s china. I’d call it a statement piece. Archie McPhee will set you up. In my product design world, this was a hot piece made by Matty Sallin, a graduate student at New York University. 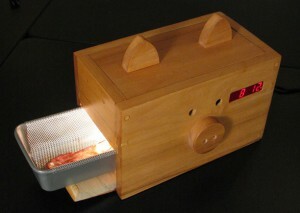 It is an engineered an alarm clock that cooks a slice of bacon in lieu of ringing a buzzer. Resume on this blog if you need a lead on design talent. For the stocking suffer or Hanukkah gift, this might make a fine choice. 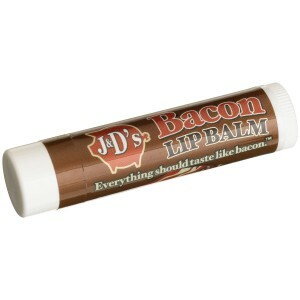 I think it is an easier sell than bacon flavored toothpaste. If you already love syrup, pancakes and bacon together then why separate them? 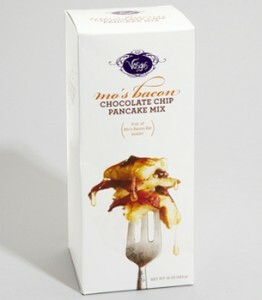 This gourmet pancake mix comes with the bacon already in the mix. And they don’t stop there. The mix also has chocolate chips in it. Whoa! 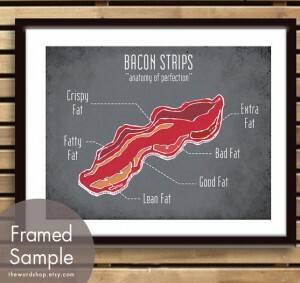 I encourage a key word bacon search of Etsy.com if you want the truly unique. I’m coveting bacon jewelery and decorator items. And I am always a sucker for art in a frame. Find this print at The World Shop on Etsy. Since the print is sold without a frame, I’d say they need to visit my website and let us work up some contract framing options. 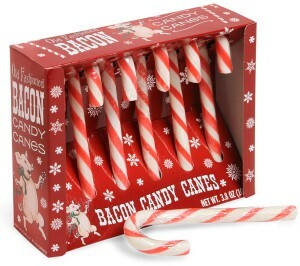 Happy holiday shopping HR bacon fans. I’m humbled you choose to read my little blog. Being in business for yourself is not for the faint of heart. Especially in these economic times. 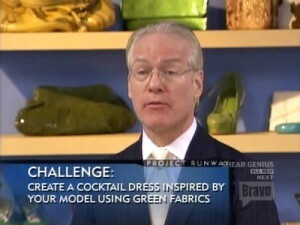 My point of view on this “challenge” topic is based on running a small business. I suspect I won’t find my list far off large corporate issues and struggles. I also wanted to take a broad stroke perspective, not just from the HR department. Because I feel HR needs to think in broader terms about business in order to understand how to impact it. I believe the list below is enough to bite off. Number two and three are challenges but, they are challenges I love to face head on like a creative project. #2 and #3 are harder to advance in tough economic times. I make lots of lists and plans about how to tackle technology and innovation. Sometimes I succeed and sometimes I fail. And the solutions tend to ebb and flow based on cost analysis, employee feedback in the process, style trends and what my customer’s want. Some people might put “sales” as a challenge. But, as an ecommerce and personal selling business, if you are addressing #2 and #3 sales will come if your market audience is targeted enough. But, do you have the talent pool ready to tackle challenge? Are your employees allowed time to really think about ways to innovate and advance technology? Or are they boxed in by fear of failure or profit loss or non billable, uncompensated time? #1 is a thorn. Government regulation and the ever shifting sands of tax code is a big bad ugly monster. Something must give. The system is not working at all for small businesses that value taking care of their employees and working efficiently. I won’t go into the solution or politics. It is really about how these regulations are made, managed and implemented. Not that we don’t need regulations or taxes. I can certainly address examples of the problem. Healthcare is the other white meat of government scorn. I recently read a quote from Walmart’s President and CEO Lee Scott who admits, “In some of our states, the public health program may actually be a better value – with relatively high income limits to qualify, and low premiums.” [Transcript Lee Scott Speech, 5/4/05] Really? If Walmart can’t deal, then how can my little company deal? #4 is an interesting challenge nugget. I hear businesses complain a lot about change management. When our customers go through change it brings a sense of uncertainly as a vendor. Will they bring “their people” to work with them and let us go? Will their working style mesh with my companies already established, profitable work flow? Will we have to start all over again building confidence in our service? And in some cases we are training the buyer about how our products answer a cultural need in an organization. Will we wrestle with import competition? Can our bottom line continue to price-point compete? (see #2 and #3) I feel our concerns are the EXACT same things going on in the heads of employees when change arrives. And I have seen it handled both well and poorly. All henge on good communications and valuing what everyone brings to the team. So those are what I see as major challenges businesses face today. My business partner said he would also add finding great employees can be tough. My Project Social partners Dave and Laura also have their list to ponder. Wonder how Dave’s DC trip to the SHRM Leadership Conference has altered his perspective on challenges since this blog topic was chosen? So be sure to check out their posts over at “HR Official” and “Working Girl” I would also love to know if you agree with my challenge list. But, if it is just too heavy then I challenge you to this question. Which is a Better Way to Cook Bacon?